Australian tennis legend John Newcombe (right) was with former President George W. Bush the night he was arrested for DUI in 1976. 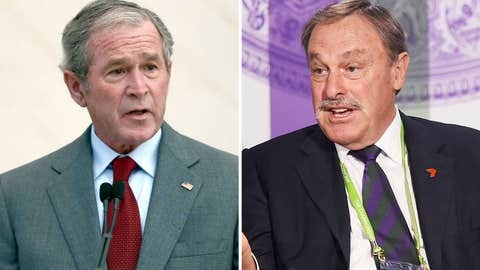 Australian tennis legend John Newcombe revealed new details about the drunk driving incident that threatened to derail George W. Bush’s bid for presidency when it emerged just four days before the 2000 election. The seven-time singles Grand Slam title winner was George W’s drinking partner that fateful Labor Day weekend in 1976 when the future president was arrested for DUI. Newcombe told the Sydney Morning Herald that he and W., whom he called "a bit of a party boy in those days," had engaged in a beery drink-off at a local Kennebunkport, Maine, bar before the arrest. "I noticed that George was sort of eyeing me off," Newcombe recalled. "So I put on a bit of a pace and he’d keep pace with me." "After about four of these [beers], I picked the glass up in my teeth without my hands and skulled it straight down and I said, ‘What are you made of, George?’ And so he had to do that." The egging didn’t stop there. Newcombe recalled drinking another beer from the wrong side of the glass. "I looked at him and go, ‘Have you got any guts, George, or what’s your story?’ So he did that." The Aussie then said his wife had offered to drive, but W insisted he was fine. Newcombe also recalled W. being "a bit cheeky" with the arresting officer before it was revealed that he was the son of George H.W. Bush, the then-director of the CIA. George W. Bush pled guilty to the DUI, was fined $150 and had his driving privileges suspended in Maine. He later said he gave up drinking altogether during the 1980s.